This page contains pictures and information about Orb Web Spiders of genus Eriophora and Araneus that we found in the Brisbane area, Queensland, Australia. Genus Eriophora and Araneus are very close related. Some species are sometimes put in one genus then put back into the other. They are from small to large in size. Most of them build vertical orb web. They are different in colours but most have the similar body shape. 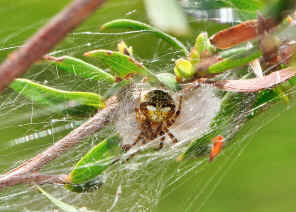 We found a few species of Orb Web Weaving Spiders and listed in this page. This spider also called Wheelweaving Spider or Orbweaving Spider. 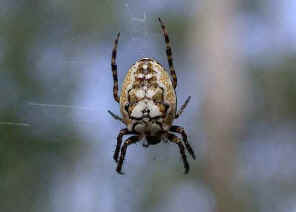 This is the most common spider in our area. We can easily find them from 5mm size to 50mm size in our garden. 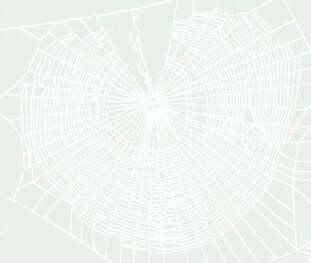 We have recorded how they build their webs and how they capture their prey on another pages. 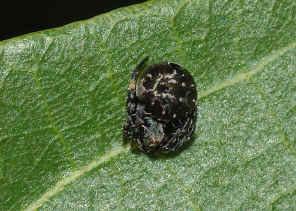 Garden Orb-weavers have their abdominal pattern highly variable. To see the different pattern that we collected, click here. 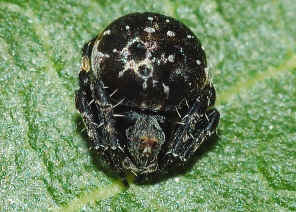 We found this spider once in Karawatha Forest on Dec 2008. 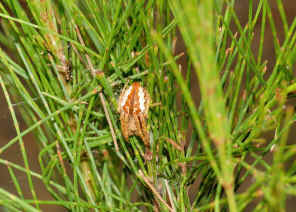 It was hiding among leaves on a She-oak pine tree. 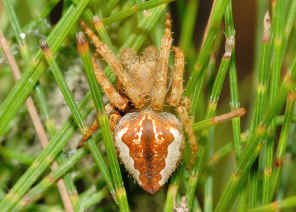 The spider has the body shape similar to the Garden Orb Weaver but orange-brown in colours. Please check this page for more infromation. Pictures taken in Yugarapul Park on Nov 2007. 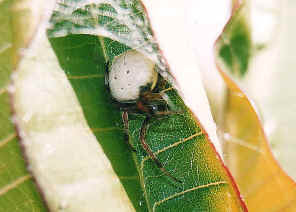 The spider was hiding on its silky retreat on leaf. Please check this page for more information. Pictures were taken on Nov 2007 near Bulimba Creek in Sunnybank. 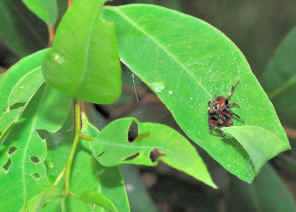 The small spider was hiding on leaf. It is metallic black in colour with grey-silver dots. 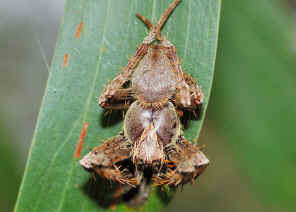 Please visit this page for more infromation about this spider.. This spider builds vertical orb web with one single stabilimentum. There are many of them on the hill top of Toohey Forest. 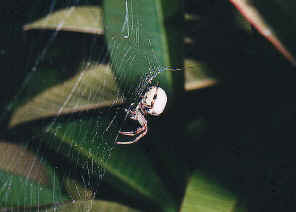 They remain on their medium size vertical orb web during day and night. Please visit this page for more details. This is a small spider. It is winged but it cannot fly. Its wings are just the yellow patterns on its abdomen. 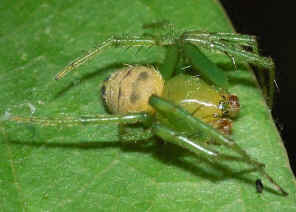 Please check this page for more information on this spider. 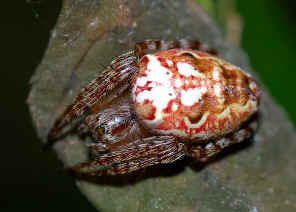 We found this spider once in Karawatha Forest on Feb 2010. It built a messy web on leaves. We found this spiders once in our backyard during late summer. It curled a large green leaf as retreat. In day time its hided in the retreat. It rested at the middle of the web at night. There is a thread from the centre of its web linked to its retreat. So even when it hided in its retreat, it sensed by the link thread if there was prey get caught in it web. More pictures and information please click here. 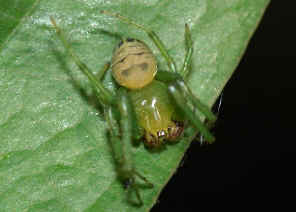 The Leaf Rolling Spider has the orange brown thorax and legs with greyish-white abdomen. 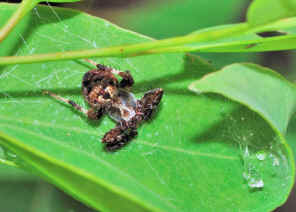 It builds the same type of web and similar retreat as the Leaf Curling Spider. However, this spider is less common than the other one. Please check this page for more information on this apiser. 1. A Guide to Australian Spiders - Densey Clyne, Melbourne, Nelson 1969, p64. 2. 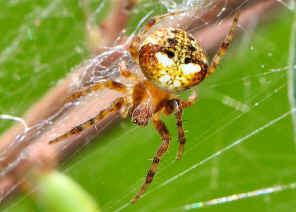 ARANEIDAE Orb or wheel weavers - Save Our Waterways Now. 3. 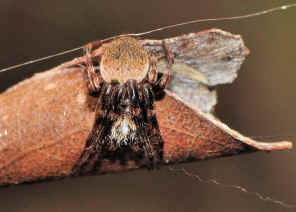 Spiders - genus Eriophora - lifeunseen.com, by Nick Monaghan, 2007. 4. 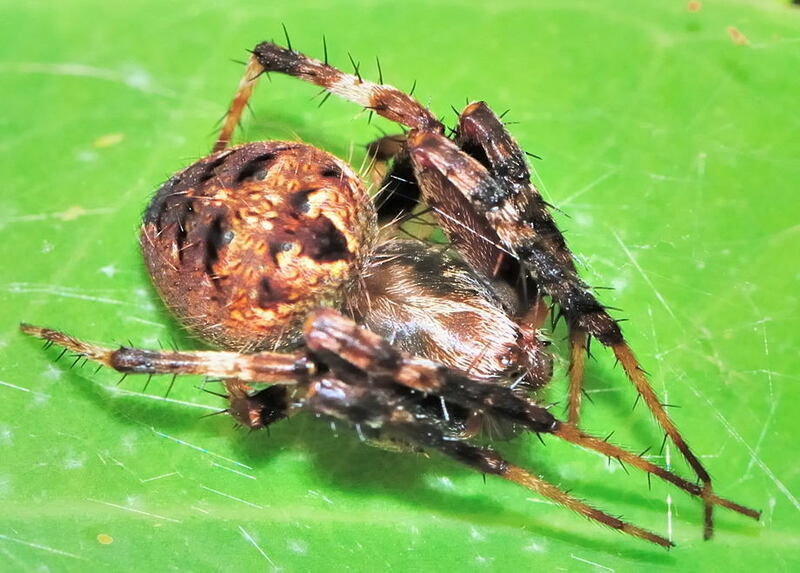 Genus Eriophora Simon, 1864 - Australian Faunal Directory, Australian Biological Resources Study. 5. 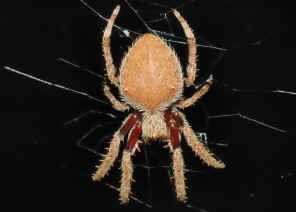 Genus Araneus Clerck, 1757 - Australian Faunal Directory, Australian Biological Resources Study. Download large pictures in our Wallpaper web page. Give us comments in our Guest Book, or send email to us. A great way to support us is to buy a CD from us. Last updated: March 18, 2010.